Orders are shipped FedEx Ground/Home Delivery, Expedited FedEx, USPS Priority Mail, or very small orders that qualify for First Class postage. For orders including Probiotic Jar Systems, we always ship FedEx because of their very careful handling. * If you order one or more complete Probiotic Jar System(s) and give us a USPS Post Office Box as a delivery address, we will first contact you regarding a FedEx delivery address, and if you don't provide one within two business days, we may ship USPS with the understanding that you may be required to return damaged merchandise to us at your expense and pay additional postage to reship merchandise to you. USPS insurance does not include shipping costs. Some orders will be cancelled before shipping if we determine that the shipment will most likely not arrive undamaged by the USPS. Shipping charges are calculated using live rates with the USPS and FedEx, based upon your delivery location. We recognize that shipping costs are an unwelcome expense. We receive some small business discounts from FedEx, and pass those savings on to our customers, and have employed every available opportunity to reduce shipping costs as much as possible. If you believe that the shipping charges are excessive, please make a comment when the order is placed, and we'll verify the costs for you before charging your order. Unfortunately, it is expensive to safely ship glass. Saving on Shipping Charges is best achieved by purchasing more than one small Probiotic Jar System at a time. The single Systems have the highest per-system charges because there is a minimum cost to move a box from point A to point B, and the further away from the shipping center you are, the higher that cost. It does not cost twice as much to ship a 6 pound box as it does a 3 pound box. FedEx Home Delivery is the service that includes actual FedEx delivery all the way to your home, and is not the dreaded FedEx Smartpost that utilizes the US Postal Service for the local delivery of your product, which has become known for excessive delays in delivery and excessive damage. Below is a chart from FedEx that can help you determine the service to choose based on estimated shipping time, and please allow three business days for processing your order. At times we are able to process and ship within hours, but during busy times as much as three days are needed to process and pack orders. Orders are filled first come, first served basis, and Home Delivery is delivered Tuesday through Saturday. This is a ground service, and delivery estimates are not a guarantee of speed. If you require delivery by a specific date, choose 2-Day shipping, so that your package will be guaranteed to arrive within five business days from the time you place the order. We'll pack your order carefully so that unless it falls off a truck doing 50 mph on the highway and is then hit by a car, it should arrive intact. We double box our glass and use enough peanuts to do the job. You don't want to deal with broken glass and neither do we. In the unlikely event that your glass does break during shipping, we will accept a photograph of the broken Jar nestled in our packaging, and ship you a replacement at our expense. If the Lid is damaged, we will require that it be returned to us for replacement. We have had just a few broken jars out of all the tens of thousands of orders that have shipped out, and that's a shipping record that we are proud to share with FedEx, who does a wonderful job for us. If you supply us with a USPS Post Office Box for delivery of full Probiotic Jars, this guarantee does not apply, and reimbursement/replacement for damages are limited. If you do receive an order with damaged items, you must inform us within 14 days of receipt so that we can file an insurance claim. Tracking numbers for your order are generated automatically by our system and emailed to you when the order is packed. FedEx.com gives detailed tracking information, once they physically receive the package from us. Between the time that we pack your order and the time that FedEx takes possession of the package, the website will indicate that the tracking number is invalid, therefore you should give it some time and check back. You can check the status of an order and obtain your tracking number at any time by logging into your account. If the status states "shipped" then the order has been packed and the shipping label has been generated and it is ready to be scanned and accepted into the FedEx delivery network. From time to time we do not have tracking numbers available for USPS depending upon the service utilized from that carrier. Out of stock items are rare, but if you order an item and we can't ship it within a week, we'll contact you to find out if you want to hang in there, or we'll give your money back. 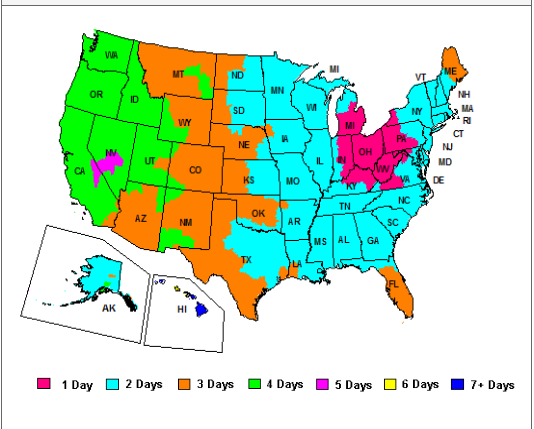 Our shipping fulfillment distribution centers are located in Ohio and Alaska. Some orders, depending upon your location and our warehouse inventory, may be split and arrive in two or more boxes. This will not affect your shipping charges. We apologize that online orders cannot be picked up at our shipping fulfillment distribution centers due to the nature of our contractual agreement with those centers and the insurance limitations. You can contact us to locate an authorized reseller in your area, or consider becoming the reseller for your area! *Special Exception for Alaska: FedEx rates are often higher than the value of the order. For these orders, including complete Probiotic Jar Systems, we also offer USPS Priority Mail, and we pack with larger box sizes to avoid damage, and charge additionally for insurance. This makes it possible for us to ship reasonably within Alaska, our home state. FedEx Shipping Time Chart for Ground/Home Delivery (after order processing). After FedEx receives the package, the tracking number automatically generated and emailed to you by the system will allow you to access complete tracking information including the projected date of delivery for your order. The chart below is not a guarantee of delivery time for ground service; it is an estimate. If you need a guaranteed delivery date, please choose 2-day shipping and within the US you will receive your package five business days from the time your place your order. FedEx does not give refunds for delays on ground shipping service.